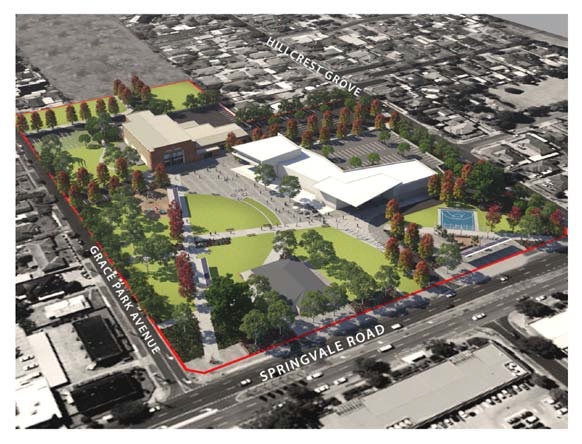 SPRINGVALE civic precinct’s multi-million dollar make-over is a step closer to being locked in – but still up to 20 years from becoming a reality. Councillors approved the draft Springvale Civic Precinct Master Plan for further community consultation at their meeting on Monday. Next year, City of Greater Dandenong will largely vacate its Springvale premises and move to the new Dandenong municipal building. So in 2007, following community consultation, the council endorsed a concept plan for what would happen to the vacant site. The plan endorsed this week incorporates and supports previous community consultation and establishes a long-term vision for the area. Implementing it would costs between $35 and $45 million over 10 to 20 years. Council corporate services director Mick Jaensch said borrowings to fund the Dandenong municipal building would mean no more loans until 2017/18 to ensure a healthy debt ratio. The plan proposes retaining and refurbishing the city hall and supper room. “Through the community consultation process, these buildings were identified as iconic buildings for Springvale,” the report said. The council chamber building is to become a community meeting space and accommodate customer service until a new library and community building is constructed. The current Springvale library is too small, struggling to meet today’s needs, and poorly placed to meet tomorrow’s needs but would continue to operate undisrupted until its replacement was operational. The report commits to finding new accommodation for Springvale Historical Society, with its current space destined for the wrecking ball. The draft master plan also impacts the building the Springvale Indo-Chinese Mutual Assistance Association (SICMAA) now occupies. “The council has recently reached agreement with this group on alternative arrangements and the building they occupy will be demolished once these new arrangements are implemented,” the report said. The master plan proposes to consolidate car parking and place a bus stop next to the library. Open space for large community events, an active sports and performance space including a half basketball court and handball area, and a relocated and improved playground are also proposed. This community consultation round is expected to be completed by September and will include face to face meetings, informal forums, community displays, advertising and a mail out to residents. COMMUNITY groups have a chance to use the Springvale council office as a temporary home – as long as they don’t trigger a $10 million make-over. Councillor Sean O’Reilly on Monday proposed a call for expressions of interest in using the vacant council offices before their demolition. Staff will move out next year but funding for new buildings is several years away. “Several community groups have informally expressed interest in the offices given their location and car parking provision,” Cr O’Reilly said. He said the move could mitigate the impact on traders of relocating staff to Dandenong and reduce the risk of vandalism on site. “It must be financial viable and demonstrate a community benefit,” he said. But engineering services director Bruce Rendall warned a “change of use” could trigger the need for a $10 million fit-out under Australian building code requirements. “A community use similar to office use might not trigger it,” he said. Councillors passed the proposal, but Cr John Kelly said it was a shame it didn’t open the offer to the broader community and private enterprise. “Perhaps we may get some interest short term from private enterprise and I imagine it would be at no cost,” he said. Cr Peter Brown said he hoped the first opportunity would go to not-for-profit organisations. He said a refugee resource centre in Dandenong was turning back volunteers because it had no space. “And it could breathe a bit of life into this part of Springvale,” he said. Expressions of interest are due by Friday 23 August and a report will come to the council on 17 October, detailing community responses, potential costs, timeframes and more.